The 25.8 metre motor yacht Sophia, listed for sale by Gregory Dagge at Northrop & Johnson, has been sold to an Australian buyer. Built in GRP by Danish yard Royal Denship to a design by Dixon Yacht Design, she was delivered in 2008 with a major interior refit in 2015/2016. The refit saw her audio/visual systems upgraded, new appliances in the flybridge and galley, and fresh carpeting throughout. Accommodation in a contemporary interior by Design Unlimited is for eight guests in four cabins consisting of a master suite, VIP suite and two doubles, all with en-suite bathroom facilities. The large saloon is 11 metres long and offers comfortable custom seating and a new Lantic entertainment centre with a large television screen and a server delivering on-demand audio and video throughout the yacht. Forward is a formal dining area seating eight guests and there is an enclosed galley. The aft deck has al fresco entertaining and dining on built-in upholstered seating, a table and occasional chairs with two sets of stairs leading down to the massive swim platform. Up on the flybridge is a second helm station, fore and aft sun pads for panoramic views and a sophisticated entertainment system. 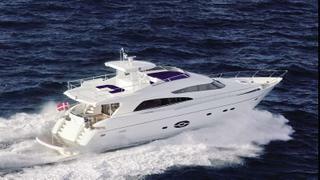 Twin 1,825hp Caterpillar diesel engines give her a cruising speed of 27 knots topping out at 32 knots.